Thank goodness watermelons are ready. 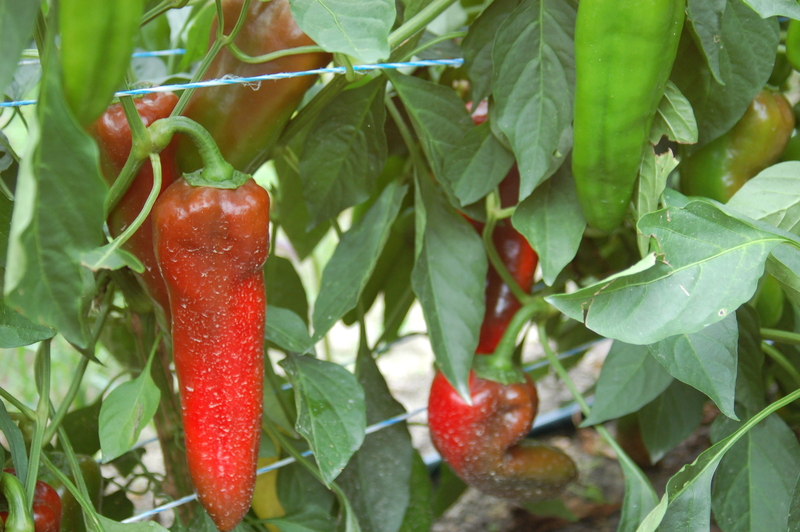 We like to grow really tasty varieties that are also a manageable size. That means they aren’t always familiar pink inside. We are, of course, required to taste test some before making them available to CSA members and farmers’ market customers. (Plus, a few always crack open during the picking/loading process. We dive into those cracked beauties with excitement.) This yellow variety is our favorite melon. We made this Watermelon Lime Cooler, pictured, this morning. (The recipe is by a local Chesterfield woman. Check out her website via the recipe link.) We doubled the recipe in order to have a drink for 7 people here, and it used less than a full melon. We also used only half of the honey the recipe calls for in order to keep things more tart. Melons love the summer heat, but salad/lettuces do not. 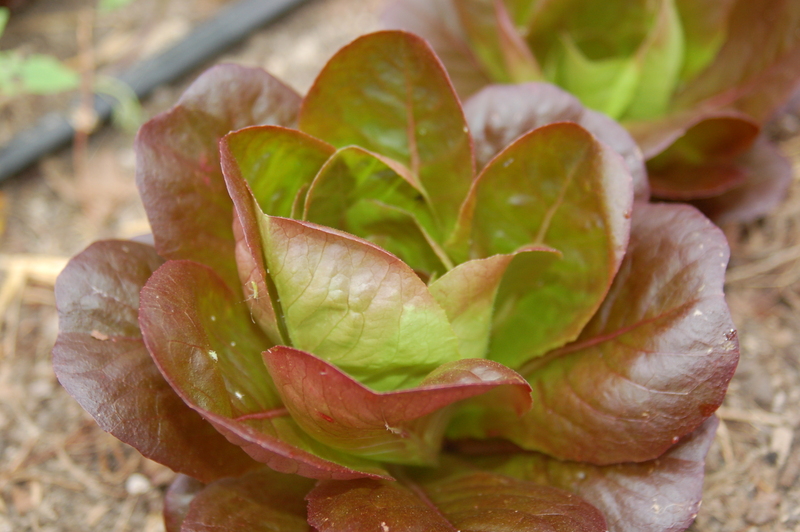 We are giving it our best around here to have salad/lettuce at least for our CSA members (Farm Share members and Market Share orders) in July and August. It’s not easy and it’s not the best tasting salad we grow, but it’s enjoyable. And part of seasonal eating. We don’t have tomatoes in March and we don’t always have salad greens in July. There isn’t any significant pest or disease issues with our summer salad greens. They just don’t grow, or simply grow only a few leaves and then shoot up a flower. That doesn’t give us salad greens to cut. 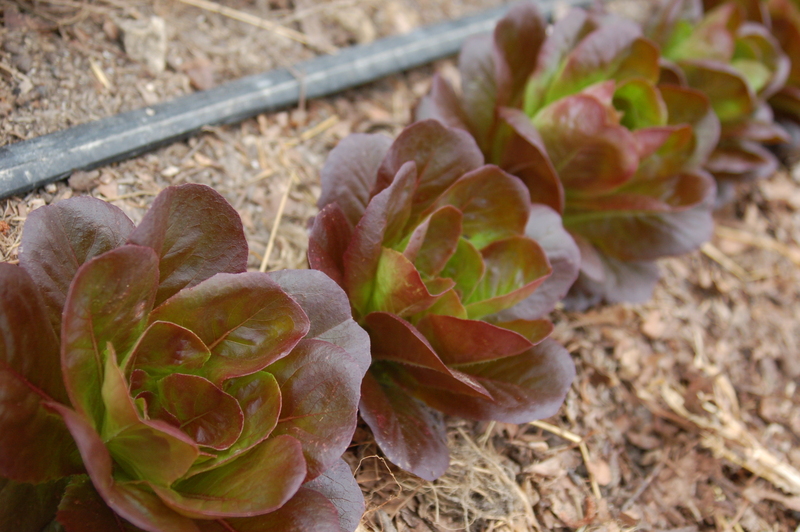 There is therefore a lot of loss with salad greens this time of year, and edible yields are low. But hey! We are on the autumn-side of July 21. Abundant salad greens are on the horizon. But not until after August. The danger of focusing on July 21 as the peak of summer heat is thinking that it’s a quick downslide to cooler temperatures. August has got plenty of blaze. This email is now obviously highlighting some of the varieties that we prefer to grow due to better flavor and sometimes better ability to grow a healthy plant under organic management here in the hot, humid Piedmont of Virginia. Those red peppers pictured above are simply better than the “standard” red bell pepper. We love getting to grow food based on these good reasons – rather than based on what transports well, or holds up well on a grocery store shelf, or what is simply familiar. We prefer to help everyone learn what the best foods are for growing and eating and nourishing us in this place. 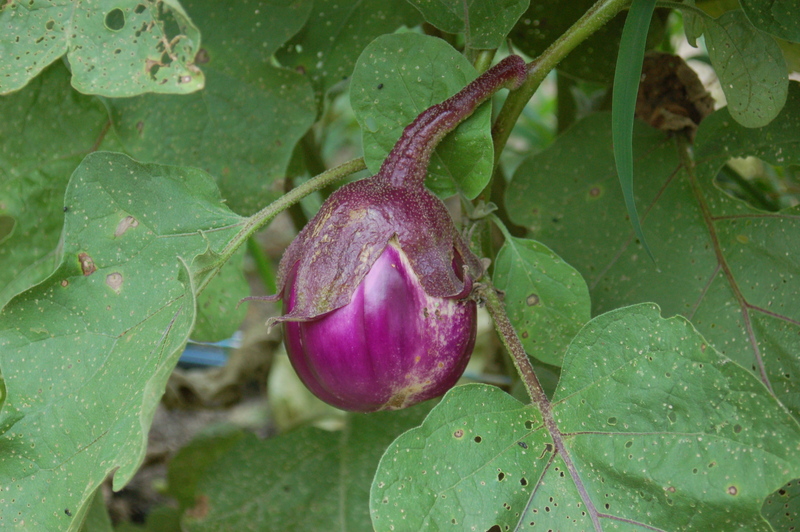 The violet colored eggplant, above, is a better eggplant than the “traditional” dark purple/black, oblong variety that is most common around here. The one pictured is not yet all the way mature/big enough, but it gives you the idea of how different it is than the more common variety. We most often prepare these by slicing them into round that are a generous quarter-inch think, spread them single layer on a greased baking sheet, drizzle a wee bit of olive oil over top of the rounds, and sprinkle some sea salt over the whole affair. Bake at 400 degrees until soft and a bit browned (15 minutes? 20?) and serve drizzled with a honey-balsamic dressing. This summer we are serving everything under a drizzle of honey-balsamic dressing. 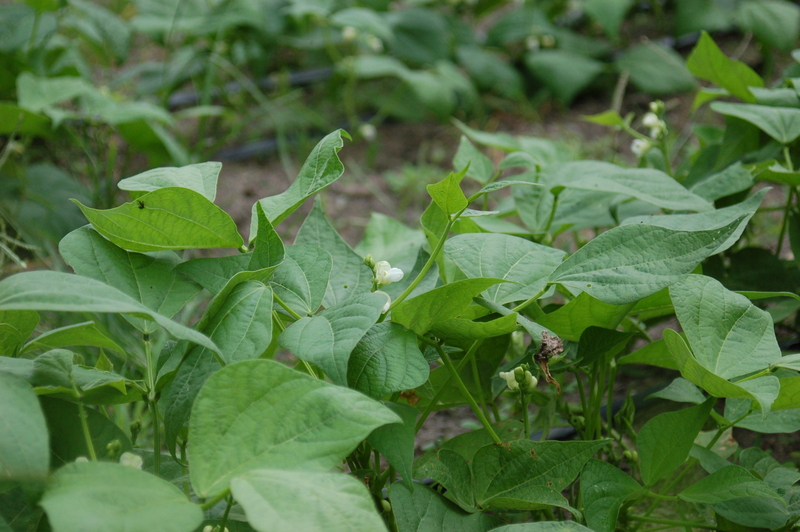 Green beans are still cranking (new flowers pictured above), and we have to give a huge round of applause to the amazing Rachel and Kyle who are picking almost every single one of these beans, by hand, kneeling down. This takes a long time and a good podcast. If you see either of these good people at market this weekend, offer them thanks for this work – even if you aren’t picking up any of our green beans. They have both been working so hard on our little farm this season, learning a ton and hopefully having their minds and bodies stretched and pushed in productive ways. Because of their help, the following is Available for Market Share CSA members to choose from this week: Basil, Beets, Chard, Cucumbers, Eggplant, Flower bouquets, Garlic, Green Beans, Kale (curly, bagged), Microgreens, Peppers (jalapenos, sweet bell, carmen, lunchbox…), Salad Mix, Summer Squash, Tomatoes (slicers, cherries, and bulk options), Watermelon…and naturally leavened Hearth Baked Bread. Peppers – This is the week for stuffed peppers! If you don’t already have your favorite recipe (we simply make a nicely-spiced medley of whatever we have around, plus rice), try a mexican-style vegetarian recipe, or a quinoa-stuffed vegetarian version. Green Beans – we love our beans these ways: Wok Seared Sesame Green Beans,Sesame Tempura Green Beans with Soy Dipping Sauce, Green Beans with Sesame Vinaigrette. Summer Squash – We haven’t yet tried Summer Squash Sloppy Joes but they sound delicious (it calls for mixing the squash with protein) and are on our list for this week’s meals. This Summer Squash Saute recipe is a way we really enjoy this vegetable. Tomatoes – we will keep repeating that we love, love our tomatoes simply diced and put in a bowl with a minced clove of garlic and a drizzle of olive oil and a sprinkle of salt. Let sit for a few minutes before serving. Our kids spoon large amounts of this on their plate whenever it is served. The alchemy of the flavors is amazing. Chard – We love love love our chard scrambled with eggs, as in this Swiss Chard Scramble recipe. 2015 Market Share CSA Members: Reserve your selection online to pick up on Saturday, July 25th at our farm, at the Brandermill Green Market, or at the South of the James market.